Jonathan is an artist, and he dances. Each year he holds an Argentine tango party. 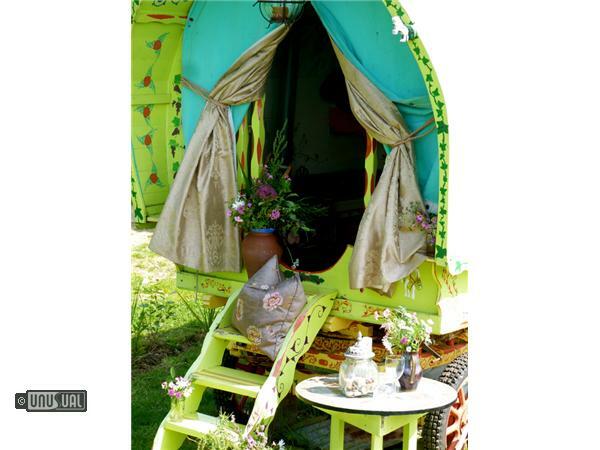 As some of his friends travel from all over the world, he decided to purchase and restore a traditional Bow Top Gypsy wagon to help with the limited accommodation on the farm. It was such a success with Jonathan's friends, that he restored another and his friends spurred him on to let these cosy and comfortable caravans for their holidays. 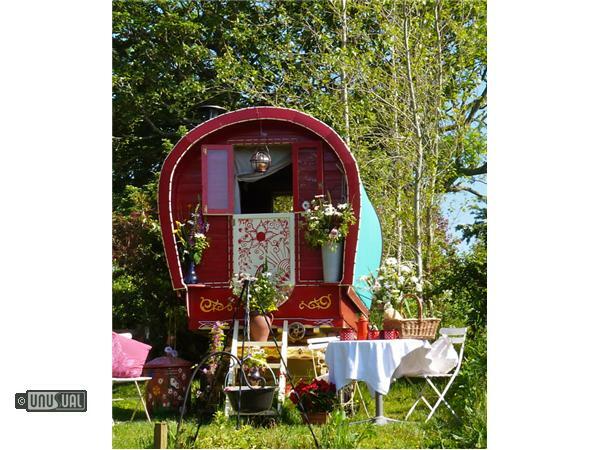 Come and experience the magic of a Romany Gypsy Lifestyle, in the enchanting orchards and fields of Tregaminion, with far reaching views over Falmouth Bay and open countryside. Elle is a traditional Bow Top Window and Door style. Built on an original dray with traditional gun carriage wheels. 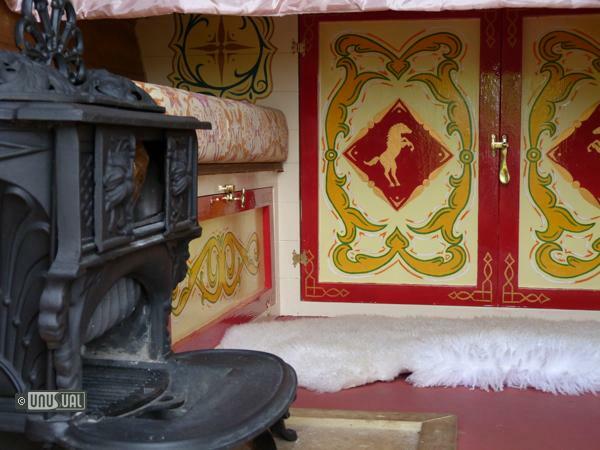 Built for a Romany by a Romany and taken to Appleby Horse Fair by its previous owner three years ago. Sleeps two. 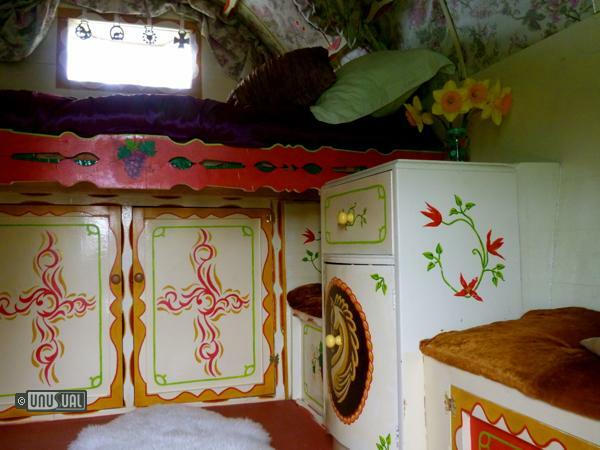 Inside there is a pull out double bed, wood burning stove, cupboards, seating, table lamp and electric kettle. Mains socket for mobiles. Outside pan box. Rosie is a traditional Open Lot Bow Top, with canvas door. Built on an original dray with gun carriage wheels. 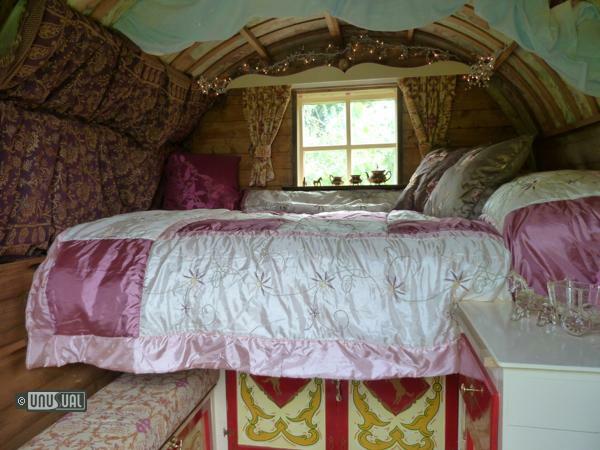 Built by a Romany Gypsy last year. Sleeps two. 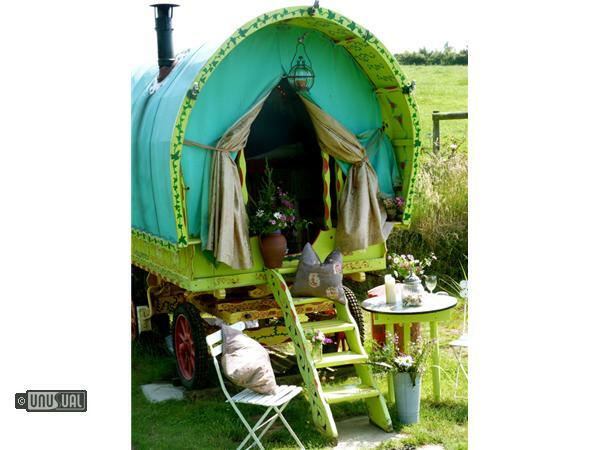 Inside there is a pull out double bed, an original Queenie cooking stove, cupboards, seating, table lamp and kettle. Mains socket for mobiles. Outside pan box. Our static wagons are available for long or short breaks. We regret that we can't accommodate dogs & we have a no smoking policy. 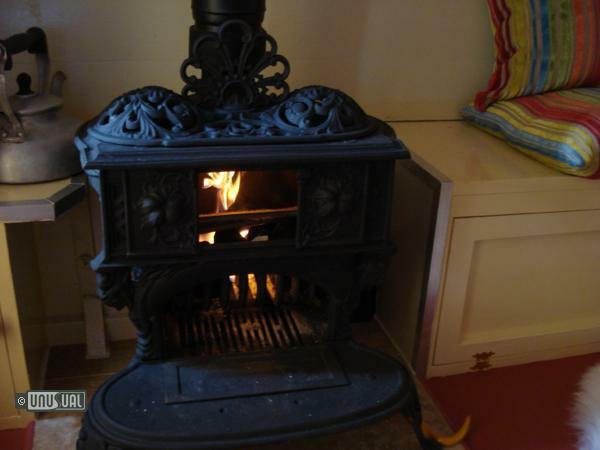 Both wagons have electricity and electric or gas heating. Electricity, water and gas are included. There is a footpath close by that leads down to the local beach, "Porthallow" less than a mile and about ten minutes walk across the fields. Porthallow has a popular local pub on the beach. The footpath also leads in the opposite direction to St Keverne, a larger village about a mile away. There you'll discover a 9th century church, post office, general store, newsagent, butchers, garage and two local pubs. At night, enjoy the peace and quiet of this secluded location and fall asleep to the rustling of leaves in the trees. You might find you don’t want to leave…. Showers and toilets in various forms are available. 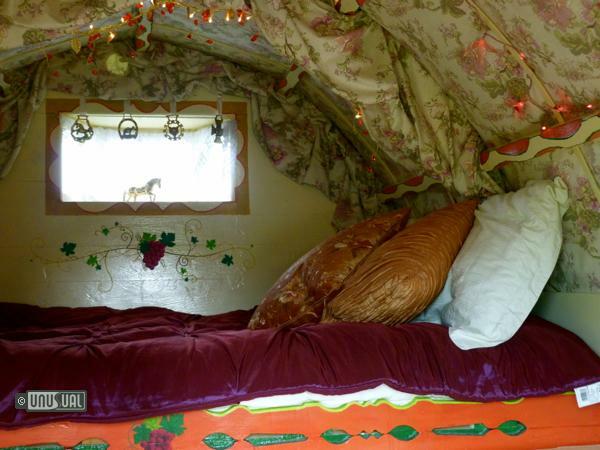 We charge £75.00 per night for all of our accommodation, except for the tipi. Which is £60.00 per night. Additional nights are at a reduced rate. From the A30 take the A39 through Truro towards Falmouth, then take the A394 to Helston. From Helston take the A3083 towards the Lizard and Mullion, then take the B3293 to St. Keverne. In St. Keverne square turn left in front of the White Hart pub. Follow this twisty road towards Porthallow for about a mile. After the Eagle gate posts on the right-hand side, take a left turn (signposted for Tregaminion). We are the first drive on the left. 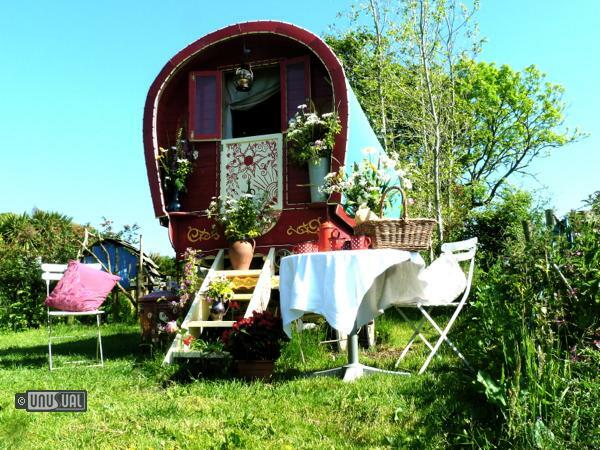 The Gypsy Caravans are situated in Tregaminion, on the lower east coast of the beautiful Lizard Peninsula in Cornwall. Well known for its quiet, unspoilt fishing villages, secluded coves and stunning coastal scenery, the Lizard is the perfect spot for a relaxing holiday break. For those looking for action and adventure, the area also offers sailing, surfing, golf, diving and horse riding. The beautiful beach of Porthallow is an easy, ten minute stroll from the tree house. Porthallow is a small, unspoilt fishing village and offers safe swimming, fishing, sailing, stunning coastal walks and a good local pub – The Five Pilchards Inn. The village holds several fetes, fairs and parties throughout the year and also has its own vineyard where you can sample locally produced wine. You can also walk to the small village of St Keverne (about 20 minutes from the tree house). Here you’ll find a beautiful church, two pubs and several restaurants and shops. St Keverne has an interesting history – it was once well-known for its smuggling ring and in 1497 was the starting point of a Cornish rebellion, led by the local blacksmith. In the church, look out for the shipwreck window which serves as a memorial for the liner “Mohegan,” which was wrecked off the coast of Porthoustock in 1898. The neighbouring fishing villages of Coverack and Porthoustock are also within easy reach of the tree house and well worth a visit. Between St Keverne and Porthoustock look out for the ancient ‘giants quoits’, a stack of large rocks which stood for many thousands of years at Manacles Point. They were moved to their present location in the 1960s to allow a local quarry to expand. If you love sailing then Cornwall makes a great holiday destination. Explore Falmouth Bay, one of the largest natural harbours in the world, discover the secluded coastal coves of the Lizard or head to the Helford estuary. There are slipways at Coverack, Helford, Port Navas, Porthoustock, Porthallow and St Antony. Explore the diverse underwater life of the Lizard at Porthkerris Cove. Porthkerris Divers is a professional, family run dive centre offering shore dives, boat dives and a range of training courses. The centre also has a shop and café. There are two local riding stables on the Lizard, offering a variety of rides to suit all levels. One of Britain’s best right-hand reef breaks can be found at Porthleven, a 30 minute drive from Tregaminion. Further along the south coast is the beach break of Praa Sands. The North coast of Cornwall is also within easy driving distance. Other great days out include Flambards Theme Park, the National Seal Sanctuary, The Eden Project, Goonhilly Satellite Earth Station, Minack Theatre, National Maritime Museum Cornwall and Roskilly’s Ice Cream and Organic Farm. Or pay a visit to St. Ives, Falmouth or Helston. £75.00 for one night £130.00 for two nights plus £65.00 per night thereafter.